I haven’t been out on my bike for just under 2 months now, for a couple of reasons. Firstly I have a problem with my knee. It came on a few months ago when I completed my last long ride – the triathlon bike course. I couldn’t put any pressure on it, although I can walk OK, I just can’t put any power through the knee so can’t peddle. I’ve tried a couple of times since but it’s still there and I can’t seem to shake it. Maybe time to go and see the doctor and get a diagnosis me thinks. Secondly my wife isn’t well and has had to spend some time in hospital leaving me to look after the kids alone. Not a problem and it’s part of being a parent. It just means I haven’t been able to get out of the house, to either run or cycle. We completed the Sport Relief mile a few weeks ago, as a family and I felt good physically, the knee held up so I was kind of happy that I could still make it to the start line for the Triathlon in June. The only problem I have now is that I haven’t been able to do any training, can’t get out of the house for long so can’t ride, run or swim so I think it’s over. My dream of competing in a Triathlon this year has kind of ended before it has started. I just need to decide if this is the end of my dream or whether I should try again for the Last of the Summer Tri in September which takes in part of the Tour de France Grand Depart route in Holmefirth. I’d love to do it but need to make sure that my knee can take it and that I can get some training in before hand. So is this the end? I hope not. Like many people I have spent the last few weekends looking out of the window in the hope that the weather will break a bit and I can get out on the bike. An aborted attempt a couple of weeks ago left me very aware that the elements can change very quickly in the hills and I shouldn’t take anything for granted especially with the UK weather. Training for the triathlon has been slow. Actually it has been pretty much non-existent over the past month since I went in for an op in mid January. It’s now mid February and up until this post I had ridden a total of 5 miles (2.5 of those downhill with a following wind), thought about going swimming, to the point where I have the timetables of the local swimming pools stuck up on the wall with the lane swimming times highlighted. Running just hasn’t crossed my mind. So to say it isn’t going well is a bit of an understatement. Triathlon number one is on the 8th June 2014 and is a ‘sprint’ event. I won’t be sprinting, just competing and completing will be enough for me. I’d like to not come last but if my last ride is anything to go by I will defiantly end up somewhere near the back. I need to get some training in and a break in the weather on Sunday provided the perfect opportunity to start. With the weather better than it had been I decided to try the triathlon course out. I never had any doubt that I could ride the distance – 16km as I have easily done that over the past few months, the only question was the route. I know the area well as it’s not too far from where I live, the route however, uses roads that I rarely drive on as it’s not on my way anywhere. 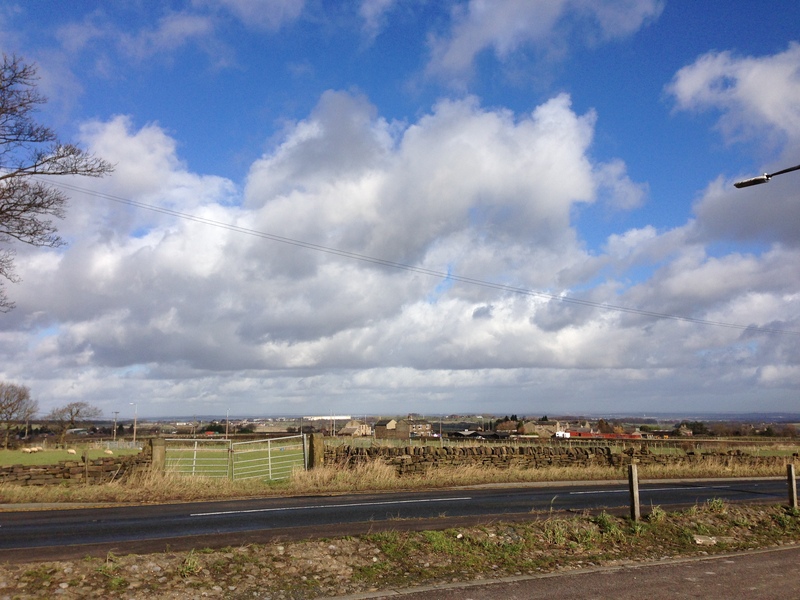 Although close to where I live, the start point of the bike course is 6 miles away, after the usual 1 mile ride uphill to get anywhere the rest of the ride to the start is downhill or on the flat – not many roads around here that are flat! 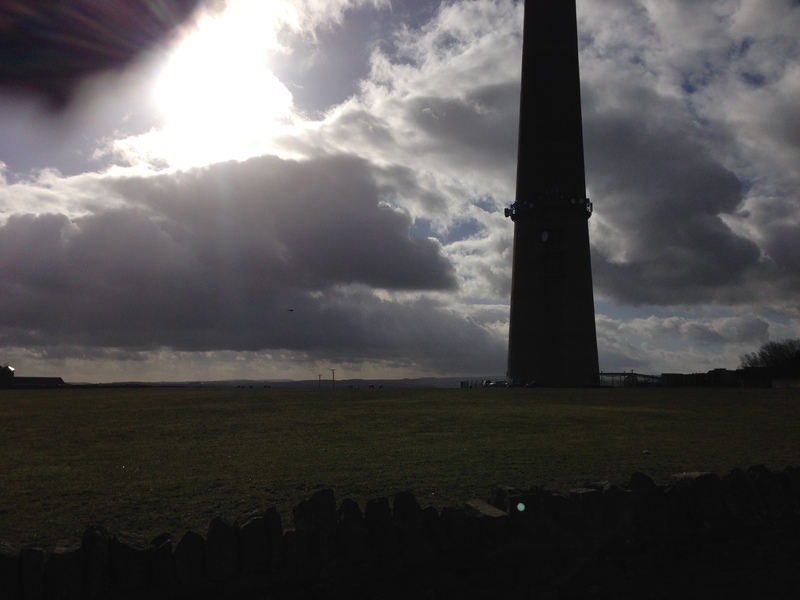 I didn’t stop to admire the starting point, choosing to keep up my momentum and ride out on the flat for around 3km before turning and facing the long climb up towards Emley Moor mast. This is a bit of a killer climb with little flat and only one very small downhill section to catch your breath on. It’s 3 miles long, a category 4 climb with an average grade of 3% and an elevation gain of 524ft. None of this is particularly hard, especially for the numerous cyclists who past me on the way up (all of them on road bikes not mountain bikes like me). The one thing I have noticed whilst out and about is how much of a community cycling is. Everyone is so polite, with a morning here, a hello there and the odd thanks thrown in when someone passes you. OK some don’t speak, some people just nod or pretend not to have seen you – difficult when I wear a bright yellow jacket and red Camelbak. The runners often say hello too, all fitness freaks together. At the summit of the climb stands the mast itself. Here was a ride of two halves. In front of me dark rain clouds and menacing skies, behind me sunshine and blue skies – pity I was heading home towards the rain! I needed to have a quick rest as my knee was feeling pretty sore and I needed to stop. Not for long, just long enough to take some pictures and stand up for a couple of minutes. Over the past couple of rides I’d noticed some discomfort in my left knee when I applied pressure on the pedal. This got much worse whilst trying to ride up the hill towards Emley (the mast isn’t actually in Emley, a small village a mile or so further down the hill) and continued to get worse the longer I went on. With the rest-bite of riding down the hill towards home the pain subsided although as the wind had picked up on the decent I found myself having to pedal just to keep moving which didn’t help. The time it took to complete this ride indicate that I was hampered by my knee, hopefully getting some strength training done and building up the muscle above the knee should help. At the bottom of the decent there are two options, left takes you back towards the triathlon course start, right takes you back towards home. As there was no point in going towards the start and being 6 miles away from home, I decided to head towards home, down a great short decent, then back up towards home. By this point I was in agony with the knee, but I had kind of planned the route before hand so wanted to complete what I set out to do. I’ve been on these roads before so knew I was struggling as I was going extremely slowly in a very low gear. But I had to do it. Not because I wanted extra distance, although always nice, but because I wanted to get back to one of my favuorite decents, down the road I cycle up on my way out. It’s not a long road, just about a mile, it’s not that steep, but you can get good speed up and I know I’m nearly home. So I did the majority of the course, I went much further than the course itself, so at least I know that I can complete that part of the triathlon. All I need to do is start with a swim and end it with the dreaded run! Looking across the Wakefield with the mast behind.